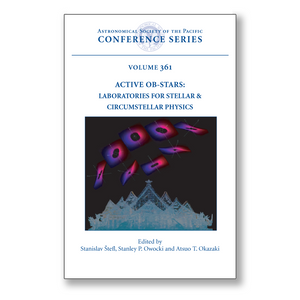 These Proceedings of an international conference held August 2005 in Sapporo, Japan provide a comprehensive, up-to-date overview of the causes and consequences of activity in the hot, luminous, massive stars of spectral type O and B. The high surface temperature of OB stars means that they lack the magneto-convective dynamo that drives activity cycles in cooler stars like the sun. Yet observations identify distinct signatures of complex spatial structure and temporal variability in several classes of "Active OB Stars", including Be, Bp, supergiant B[e], and Luminous Blue Variable stars. A central conference theme was to consider such stars as unique laboratories that enable one to study the physical processes leading to stellar activity. Since a common characteristic is the prominence of line emission arising from circumstellar material, there is extensive discussion of specific processes -- e.g., pulsation, rotation, radiative driving, magnetic fields, and binarity -- which could propel material from the stellar surface and into a circumstellar outflow, envelope, or disk. There is also close attention to the evolution of central stars and disks, and to stellar interferometric techniques, which in the coming years may allow for direct spatial resolution of circumstellar disks and envelopes, and perhaps even the stars themselves. The 14 invited reviews, 29 contributed talks, 44 poster papers, and 6 discussion sessions combine to provide an in-depth assessment of both observational and theoretical issues. The book is suitable for researchers and graduate students interested in stellar astrophysics, and in physical processes involved in activitiy, e.g. magnetohydrodynamics, radiation hydrodynamics, circumstellar disks, and stellar rotation, pulsation, and mass loss.